Today was the last day in the Masai Mara Reserve and I was ready before dawn, patiently waiting for the Sunrise. 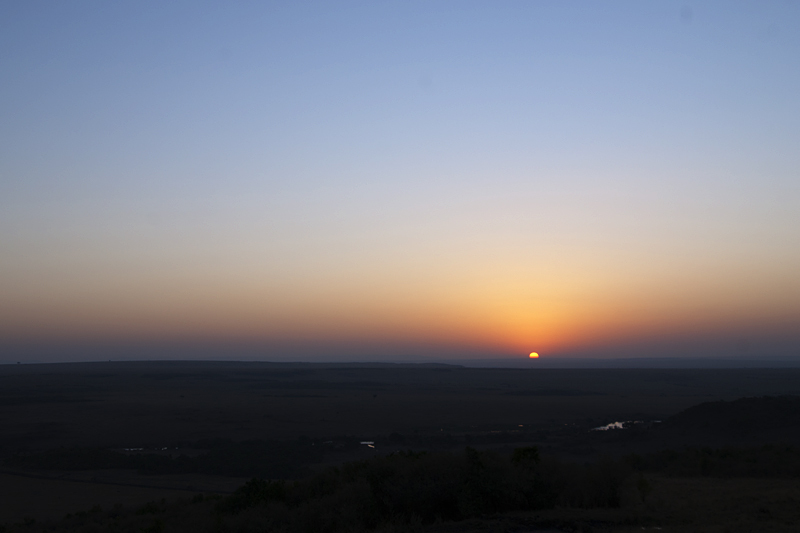 We wanted to see and photograph the gorgeous Sunrise as it lit up the Masai Mara plains. As the sun rose, the entire landscape was slowly getting lit and immersed in the gorgeous light. While all my attention was on the sunrise (below) and the skies around it, I noticed some light from the opposite direction. When I turned around, I realized the distraction was actually the light of the sunrise reflecting on the windows of the Mara Serena cottages and I decided to capture this as the feature image (first image) of this post. After watching the sunrise, we got into the Landcruiser to start our last safari on this trip. We decided to check out one of the major crossing points in the hope that we would get a glimpse of a herd of Wildebeest crossing the Mara river. 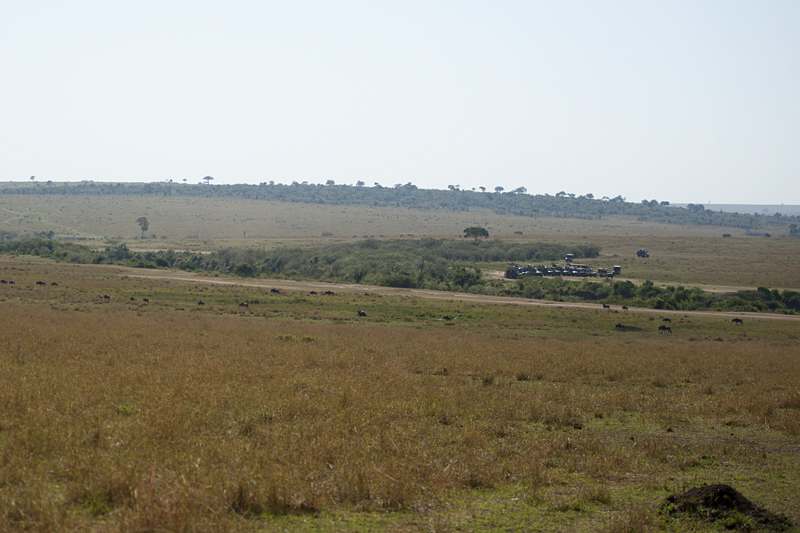 As we came closer to the crossing point, we noticed a bunch of safari vehicles (above) parked in an orderly fashion on the opposite bank. Our naturalist immediately pointed out that a crossing was about to start and these vehicles were waiting for it. 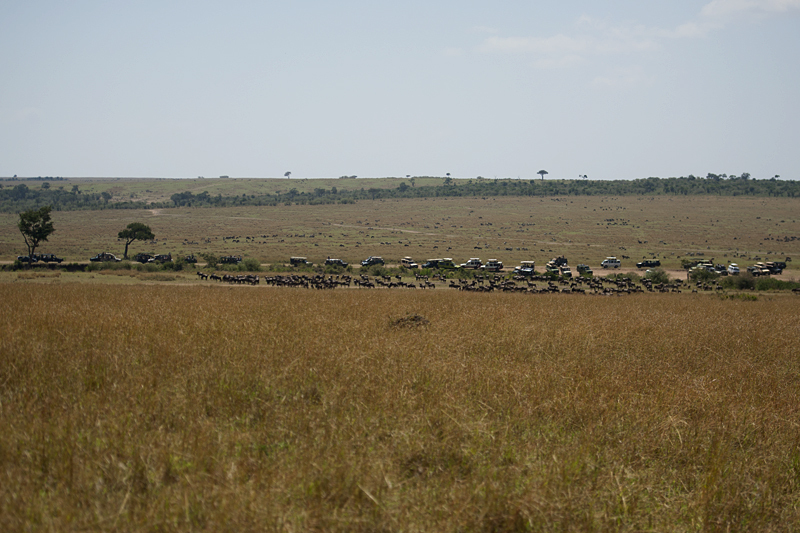 There was excitement in the air as a herd of Wildebeest were heading towards the crossing point. To everyone’s surprise two tourist vehicles (below) had mindlessly parked between the approaching Wildebeest and the Mara river, obstructing the path to the crossing point. Soon they realized their mistake and moved away. 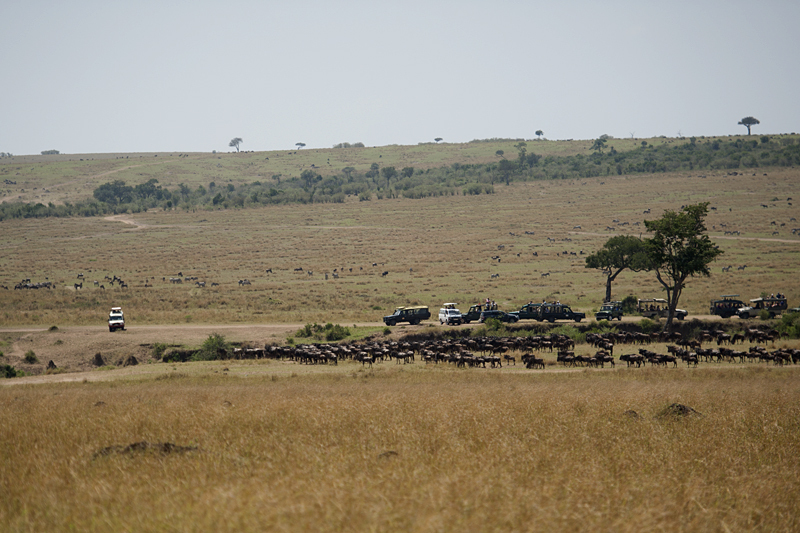 The herd of Wildebeest were congregating (above) at the edge of the crossing point and we were sure that we will finally witness the first crossing on this trip. 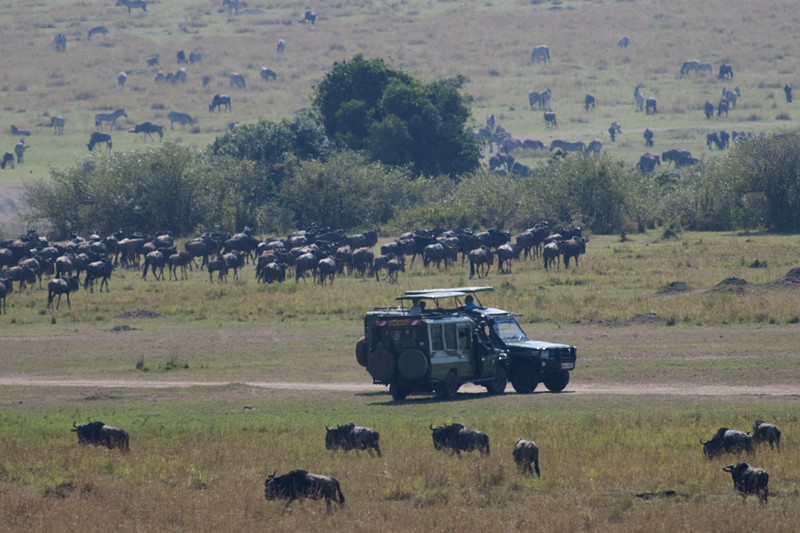 A huge number of safari vehicles were gathering on the other bank and maybe that spooked the Wildebeest herd since they turned around in the last minute and headed away from the river. 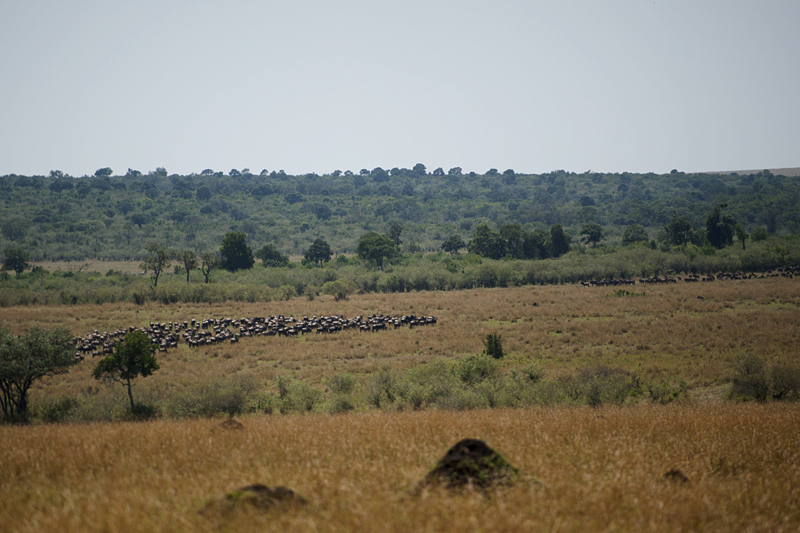 After retreading a short distance from the river, the Wildebeest herd (below) stopped and waited again. After a few minutes of waiting, it looked like the leader of the herd decided that it was not the right time to cross the river and they retreated further away from the river in the direction of rest of the herd (above). It was clear that this river crossing was a suspect and we decided to head back to the resort. 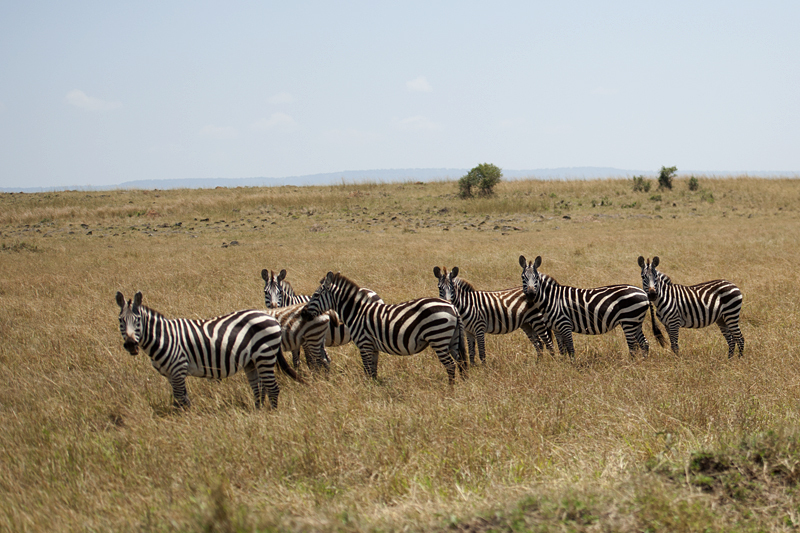 On our way back to the resort, we waved our goodbyes a herd of Zebras (below). 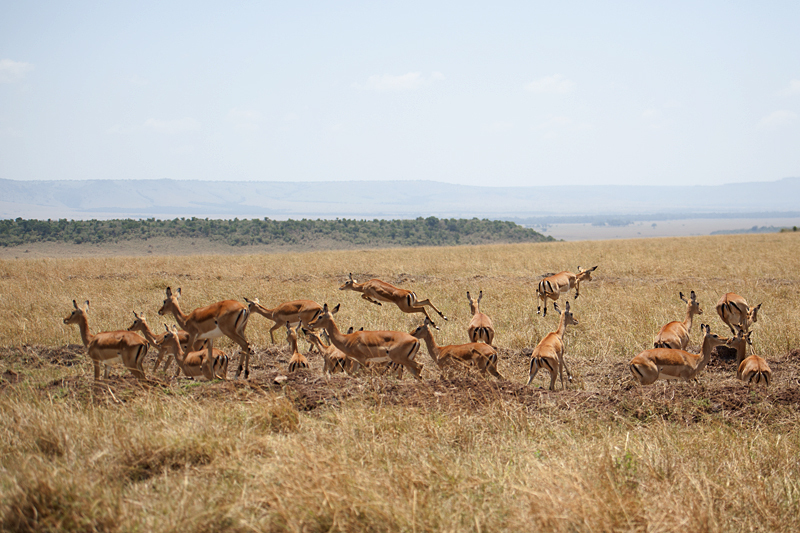 Much closer to the resort, we stopped to observe a large herd of Impalas, but something spooked them (above) and they fled away from the road and we decided to return back to Mara Serena to checkout and return to Nairobi.